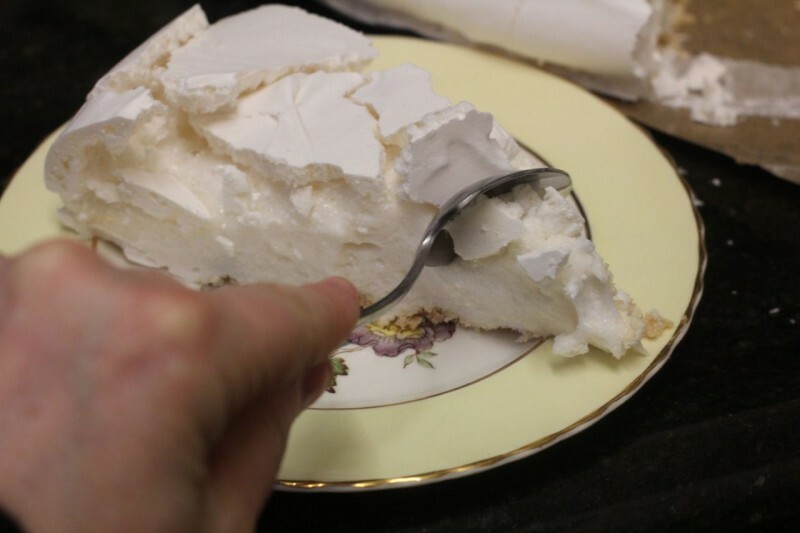 This is a recipe I have developed for a Fair dinkum Aussie style pavlova that has a marshmallowy middle, as the Aqua faba pavlovas tend to be hollow inside, but for a bit of wet chewy stuff, and it just wasn’t good enough. This is jolly good and I guarantee you won’t be disappointed if you try it! 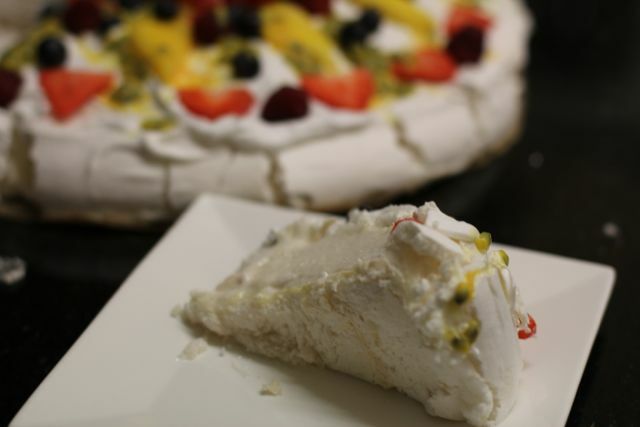 This Pavlova has a crisp outer shell and a nice soft deep marshmallowy middle. It makes a HUGE pavlova- this is definately big enough for a party or xmas and will serve probably 16-20 people . *** For this recipe you need TWO THINGS YOU MAY NOT HAVE IN YOUR HOME ,without which you cannot make this, and those are – Gellan gum High acyl LT100 (this is a necessity, you will most likely need to order online!!! ), and a candy thermometre! I know people *don’t like* having to buy new things they haven’t tried before, but believe me, it opens up a new world to have new ingredients available to you, and it is worth purchasing! WORLDWIDE: cream supplies above posts worldwide, and the postage is cheap (ie to Australia is was only £8 ish for a tub! )…so use the drop down menu in shopping basket for the shipping charge to your country! In a google search for Australia i found companies trying to charge £130.00 for what only would cost us £9.99 in the UK, so its well worth buying from elsewhere to get a cheaper product if the postage is also reasonable! 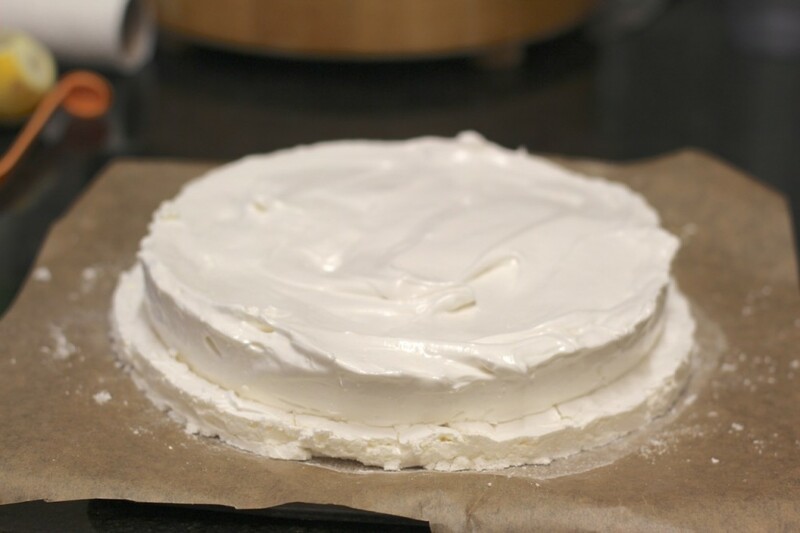 I have previously tried using Agar agar, which still made a nice tasting pav with a middle, but it was just not quite right and the agar agar couldn’t stand up to the prolonged baking. The gellan gum was the right choice for the desired outcome. Please note, Gellan gum comes in TWO TYPES : high acyl and low acyl. The high acyl makes a more strong, elastic gel and is heat tolerant and the low acyl gel makes a gel that has no stretch and is brittle.It is the HIGH ACYL gel I have used here…. Had I also bought the low acyl, I would have experimented with that too, or a blend of both,to see the difference, but will have to wait until we get paid and try that next month! If anyone else has it available and wants to give it a go, please let us know how it comes out! Right, so lets get to the recipe..it sounds convoluted, but once you have done it a few times it’s a doddle and just a fairly simple process to go through the motions, and well worth the effort! 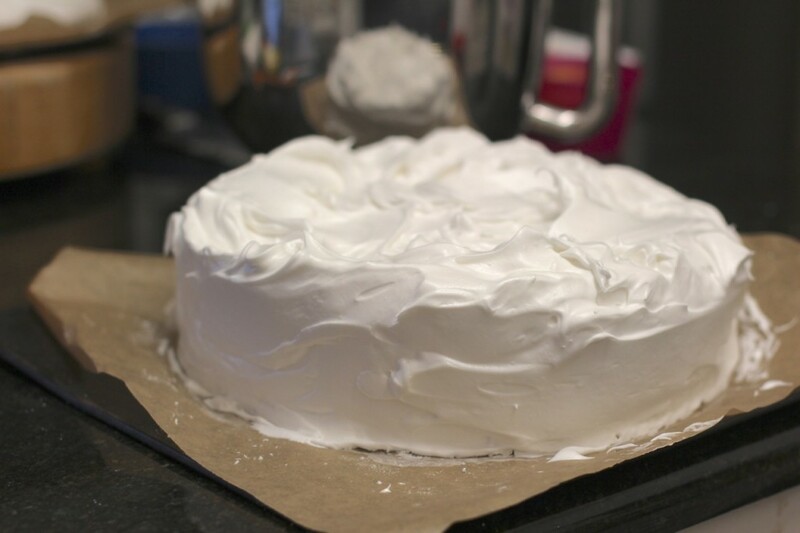 The reason that this recipe calls for a few steps, rather than just making one mix, and forming and baking it is that meringue mix forms a nice crust, but the middle is fairly hollow and what softness there is inside is a bit wet and chewy, so it doesn’t replicate a proper Pavlova to just us AF meringue..An egg Pavlova has the ability to also set with heat but Aquafaba doesn’t, so my thinking was that there needed to be something that would ‘set’ the inside to replicate a regular pavlova, but if you used it throughout the whole mix,the outside wouldn’t dry out as it should, but would be rubbery, so it needed to have a middle that had the setting agent, with an outside that didn’t- hence this 3 step process. First step Meringue base: Mix ½ cup of AF (i used Butter Bean, as i can’t taste any bean flavour at all and find it preferable to chickpea, but feel free to use your preference!) with the ½ tsp xanthum gum until it forms stiff peaks. Add 3/4 cup caster sugar, beating in between additions,until the sugar is all added and the meringue is smooth and has no graininess to it. Then beat in the vanilla. I don’t measure, but add it to taste..i would assume approx 1-2 tsp vanilla is sufficient. 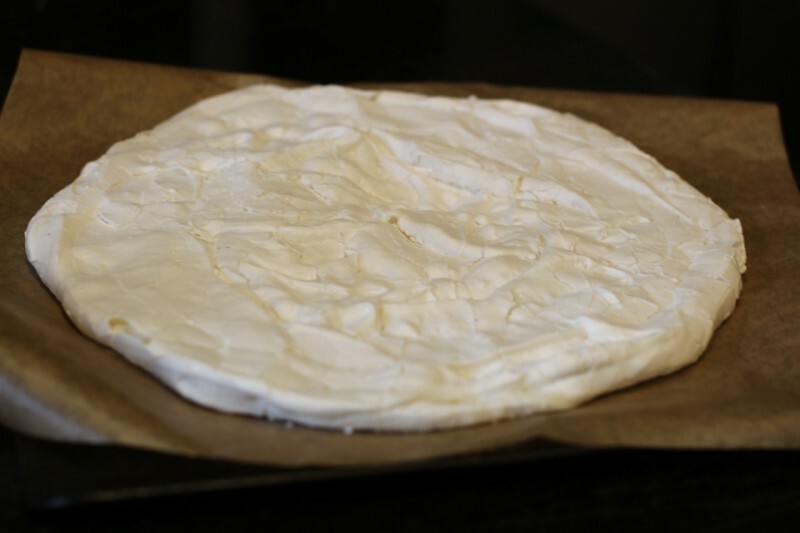 Cover a large flat baking sheet with non-stick parchment paper and turn your meringue onto the sheet, and spread into a round, slightly bigger than your springform pan. Place in the oven at 100c (NO HOTTER!) and bake . While that is baking make up the marshmallow centre. Using an approx 25cm springform pan place some parchment paper on the bottom. You’ll be juggling two processes at once here-, whipping the Aquafaba up and making the sugar syrup. 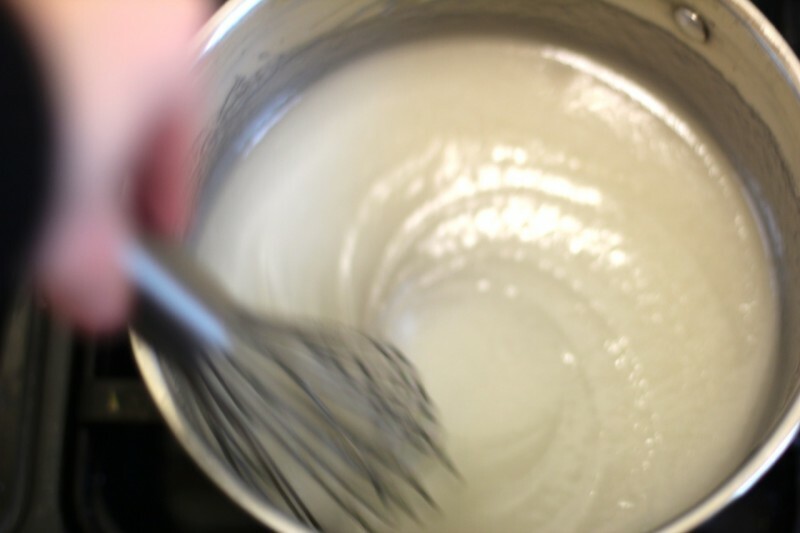 Put 3/4 cup AF in the mixer bowl with ½ tsp xanthum gum and whip to stiff peaks whilst the sugar syrup is cooking. Sugar syrup: Add 1 ½ cups of caster sugar to a DRY saucepan. Measure out the 1 tsp Gellan gum. Mine was not a flat teaspoon or a heaped teaspoon but slightly rounded. Gellan gum is strong, and you don’t want to be heavy handed or the centre will become too elastic, and thats not what we want! Gellan gum also swells once liquid hits it, so add the gellan gum to the top of the dry sugar mound and with a whisk blend the dry ingredients together properly so that it won’t clump when the liquid is added. Then add the ½ cup water and stir briskly. It will quickly thicken as the Gellan gum swells. Turn on the heat and continue stirring. You need to bring it gradually up to 250f on a candy thermometre whilst stirring from time to time to dissolve all the gel and incorportate it, and so the syrup doesn’t burn. Once it reaches 250f, turn off the heat and give it a quick whisk to deflate it and cool it slightly, then, while mixer is still running, gradually pour in the hot sugar syrup in a thin stream until it is all incorporated… The mixture will increase in size and still be quite warm ,so keep the mixer running as it fluffs up further and cools a little. Add some vanilla extract at this stage, mix it in, then turn off mixer. Take your springform pan with the parchment paper you prepared earlier. Turn out the mix, and spread it evenly across the springform pan, then put in fridge to set. At this point, its a good chance to lick the bowl and have a coffee! By the time the Meringue base looks done in the oven,(approx 1 hour) the Marshmallow middle will be set. What you want to look for to determine if the base is cooked enough is it forming cracks in the top and if the edges lift from the parchment paper if you try to peel it back.Take the base out of oven and allow to cool slightly. I make a habit of slightly flattening the base volume with my hand whilst its still a little warm, as it will have puffed up a bit in the oven. Remove the Marshmallow middle from the fridge, run a knife around the sides and release the springform pan, then invert the middle onto the base…. (try not to miss! :) ) (I suppose it would make more sense to palce the base on top of the middle and then invert them, but wahtever works for you! 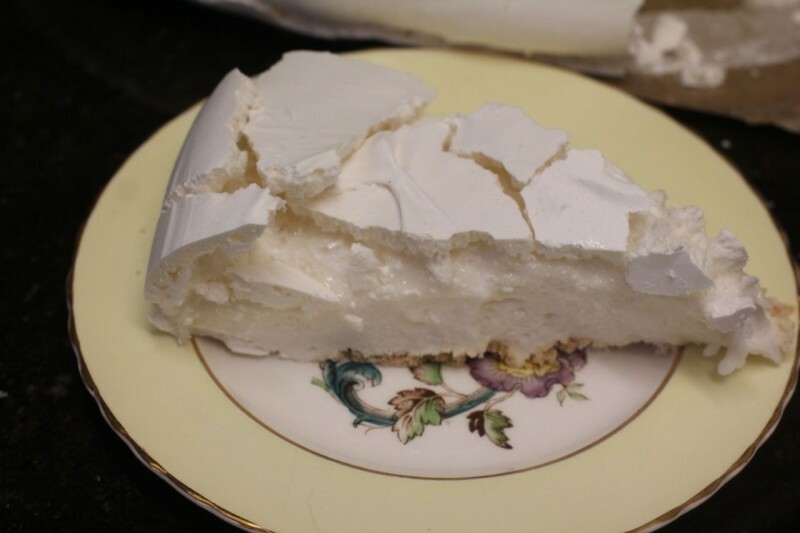 )Then trim off any excess meringue,leaving an inch spare, if you made the base a little too big (don’t worry, you can snack on those bits whilst you make the meringue topping! Meringue topping: Place ¾ cup Aquafaba into the mixer bowl with ½ tsp xanthum gum and turn on. Whip to stiff peaks. Then gradually add the 1 ½ cups of sugar until all is incorporated, then add vanilla. 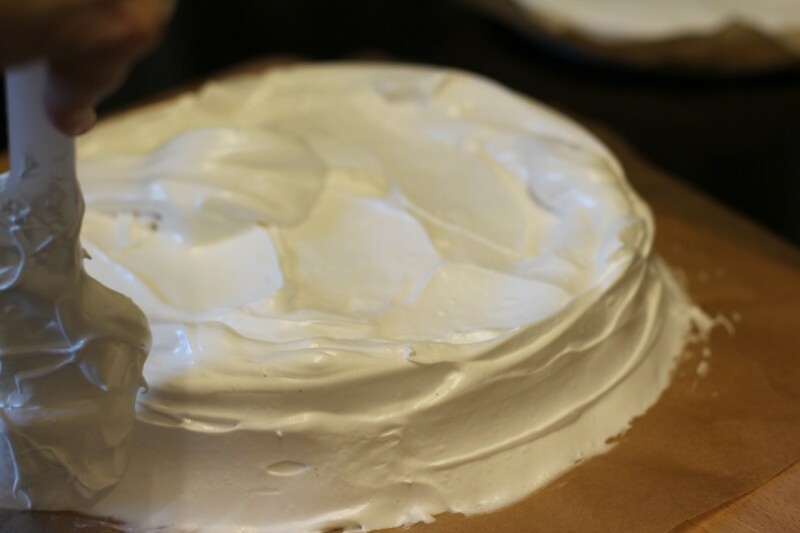 Once the meringue is ready, take your naked pavlova and cover it with the meringue topping, starting with a nice pillow on top, then take it down over the sides and spread it around with a spatula, as if you were icing a cake. 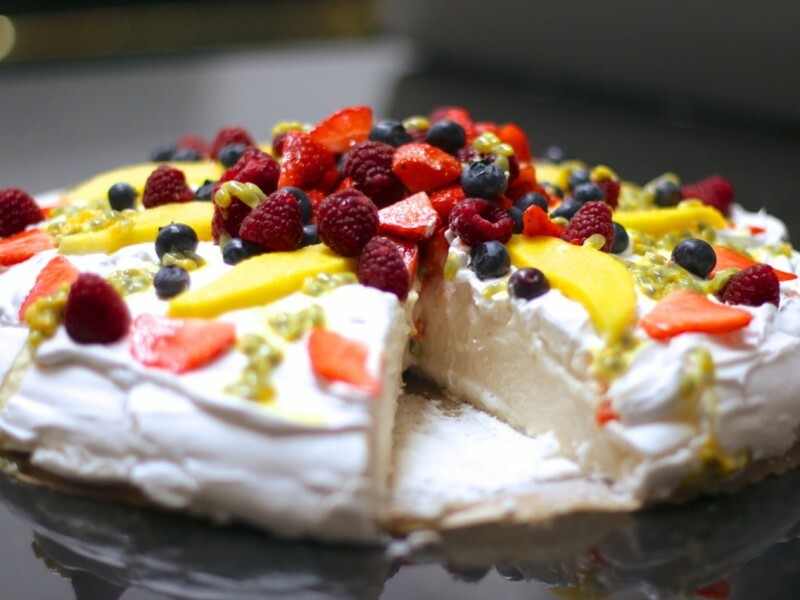 This pavlova will grow in size once in the oven, so make sure there is room on your oven sheet for expansion! Serve with whipped coconut cream with a dash of vanilla and a little sugar whipped in and topped with an assortment of fruit! 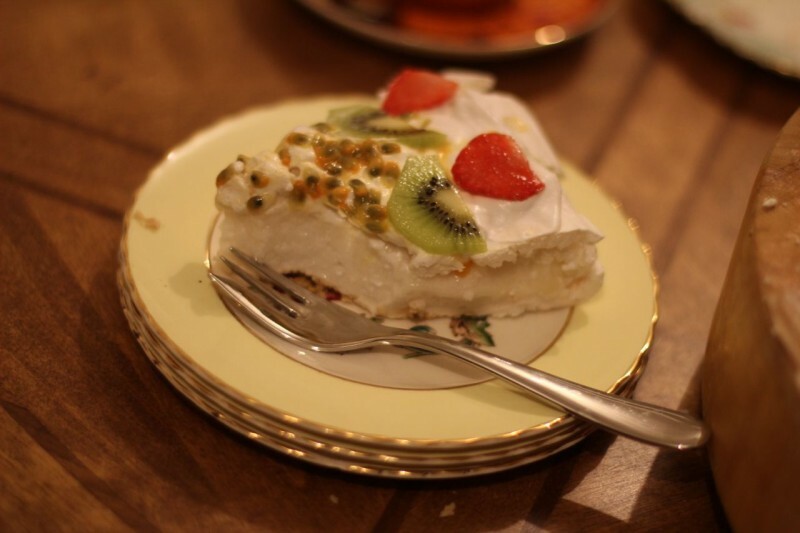 A good old Aussie Pavlova always has Kiwi, strawberries, and lashings of passionfruit!~ passionfruit is the magic ingredient! (not mentioning the non-vegan peppermint crisp pavs from the old days!) 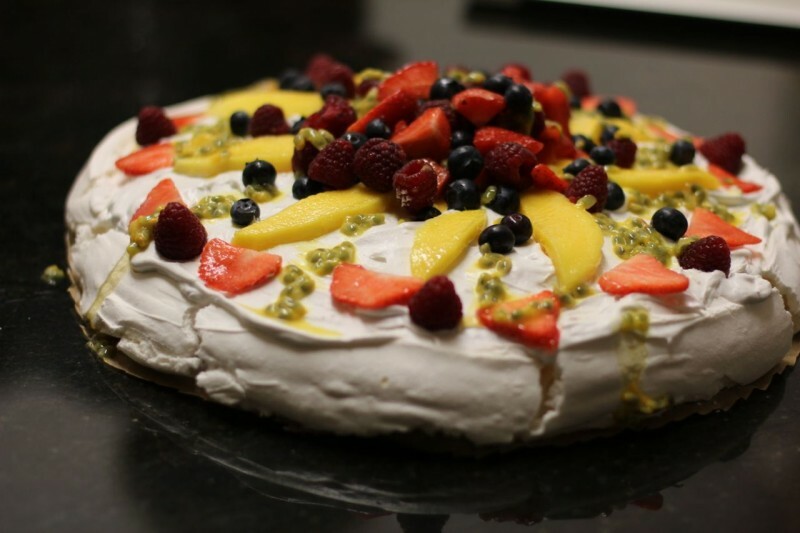 However, there are millions of combinations ,and the sky is the limit with decorating a pavlova and i CAN’T WAIT to see some amazing pavlovas you guys have whipped up at home using this recipe!!!! Enjoy!!! Thank you so much for your effort, perseverance to achieve perfection Katrina. 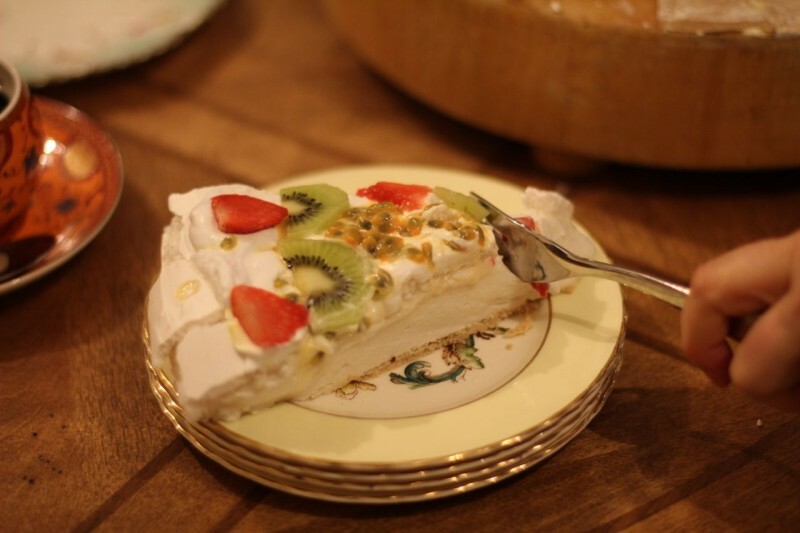 You are a pavlova pioneer . It looks spectacular. Hi Ginge The bottom layer cooked for about an hour i guess. What i watched for, was it becoming dry on top and getting cracks in it. At this point, it was 1.5 inches high or so. I took it out of the oven at this point, and flattened it down somewhat with my hand. As its going back in the oven again anyway, it didn't have to be fully dried out, but on the way to being done. 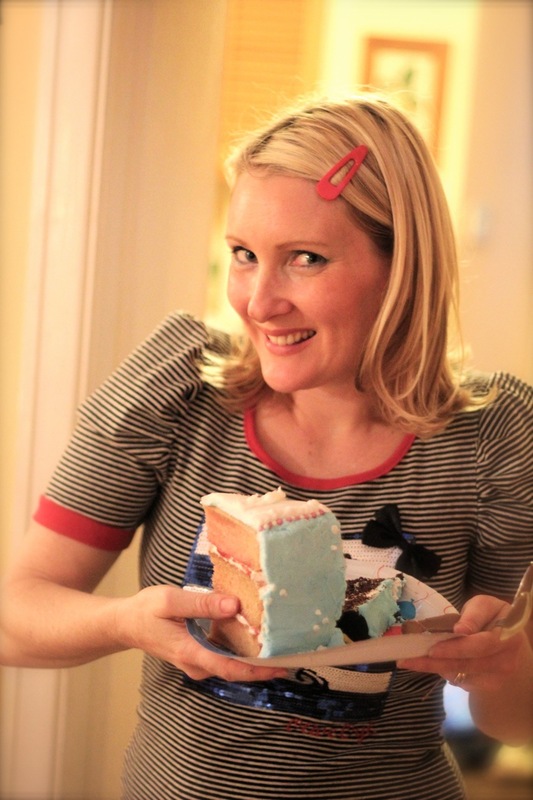 Its amazing how the base seems to disappear into the pav, when its all cooked and you cut it open! I was suprised the first time as i thought the layers would be distinguishable but they werent. Make sure you use big nice big oven sheet as it will get bigger! Katrina any suggestions on what to do if the sugar just won't dissolve???? It's been close to 20 mins! Hi Amanda What kind of sugar are you using? Caster sugar ? 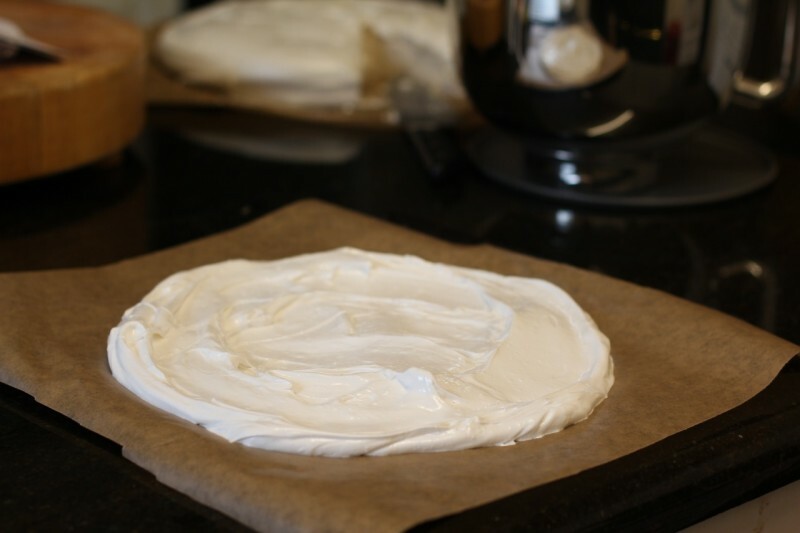 (superfine) What part of the process are you up to, and have you made meringue before with AF? The sugar we use in the UK is beet sugar, and I have had no problems dissolving it, even throwing in one third of an amount at a time... If your sugar is hard ti dissolve and you are using regular granulated, I would suggested blitzing it in a food processor to make it finer, if you don't have caster sugar (super fine) as that would make it easier to dissolve. That's odd! It's funny when something you have done before just doesn't work for some reason! That's food chemistry hey! Did you at least make some meringues out of it? I see some technical issues here, maybe because I'm using mobile. I have seen enough to know that you can solve crazy technical issues in cooking . I am looking forward to seeing what comes next. Thank you. Hi Doug What issues are obvious to you using the site? We welcome suggestions of ideas to make it more user friendly! Some issues we will find hard to resolve until we have some budget to pay a programmer, but others we may be able to. I enjoy problem solving with food- mostly motivated by my desire to eat it :) It's fun to come out with something people had given up hopes of eating again! 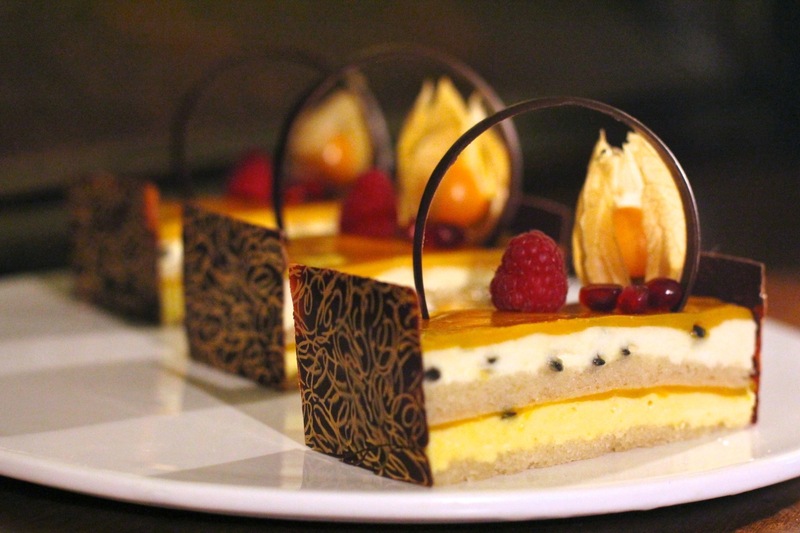 There are some great recipes in the Mousse cookbook, and I hope to do an expanded version of the E-book, as I have been excited by some of the french type patisserie desserts i can now make and would like to share my good ideas! I am also starting work on a cheesecake recipe book. 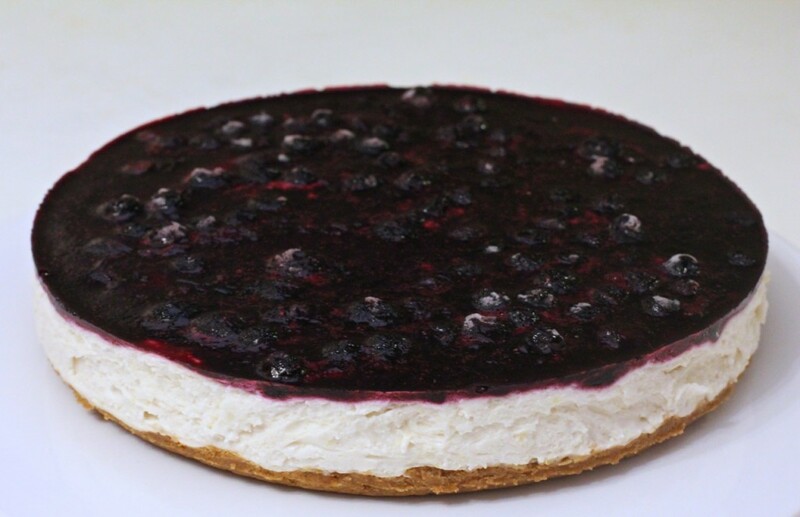 I have been playing around with some techniques to make nut free cheesecakes that taste like mains stream commercial ones! I think I will also include ways to make them soy free also as an option as some people are also not able to eat soy, but will be a bit of a challenge.I want to come up with a different product to what people have been able to make so far! Here is the first Lemon blueberry cheese cake prototype, along with a chocolate Bavarian/cheesecake. They were good! They're all gobbled up now! Ok, well your answer shed some light! I'll give you a few tips: - Get yourself a gram scale! They are cheap! This one is on ebay, but search ebay, amazon whatever in your country for gram scale and you'll find one. You will need it for alot of my recipes! it can measure tiny amounts, and believe me, I do alot of work perfecting a recipe, so if it asks for 0.3 grams of something, that's what you'll want to use to get the result! http://www.ebay.co.uk/itm/Small-MINI-Pocket-Digital-Electronic-Weighing-Weight-Scale-0-01g-100Gram-UK-/292041623214?hash=item43ff0986ae:g:qGIAAOSw44BYiZ5D -Thermometre- syrup temp is IMPERATIVE! You had a lucky guess the first few times, so it worked! 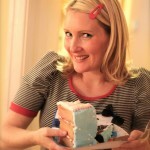 - Aqufaba butter cream icing is a different kettle of fish! The foam breaks when you add the fat, but after ages will come back together. Yes, you CAN add fats to Aquafaba foam without deflating it, and I will teach you how to do that in the Mousse E-book! 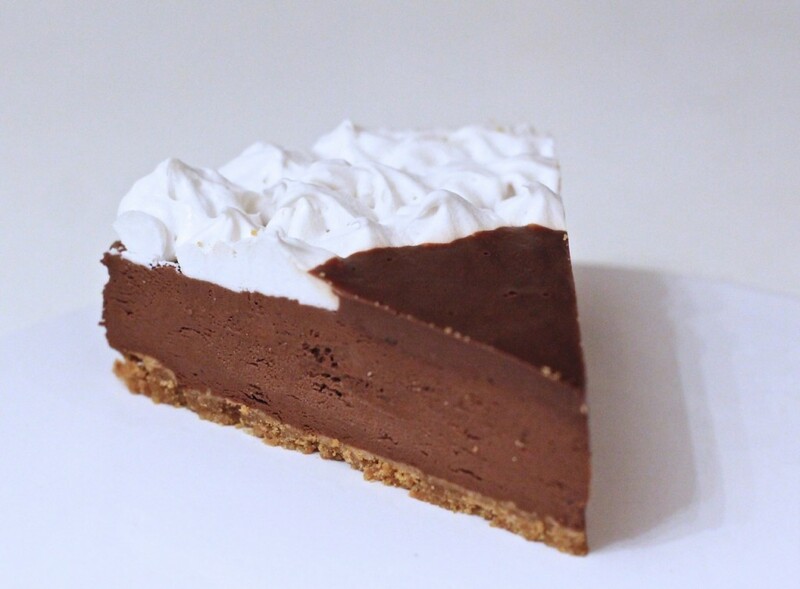 -If you don't have Xanthan Gum, you could try Guar gum, but it is commonly used for Gluten free cooking, so worth buying on the internet if you can't find it locally- again, you will need it to make Mousse. Now the Xanthan Gum is actually important, as it forms a synergistic relationship with the Agar. When synergistic parts work together, they accomplish more than they could alone, so omitting the Xanthan changes the effect. Adding more agar just makes it more solid which is not what you want when you are trying to replicate an Egg-meringue with plant foods! :) It's fun to experiment and see what you can get away with, and that's how you learn too!! But if you want spot on success with the recipe, you need to follow the instructions and ingredients to replicate the result. Once you master the techniques and understand how the ingredients interact with each other, you can tweak more successfully! I try not to unnecessarily use ingredients, as I understand some can be harder to find in parts of the world, but some are just indispensible to get the right effect with plant based food. Just a tip with your thermometre too-if you have a glass one, don't place it down on a surface once you take it out of the syrup. I have broken FOUR doing ust that, as the syrup turns to hard toffee ans snaps when you try to pull it off the bench! lol! how long in advantage i can make it, can it without adding the fruits hold for 2/3 days? yes you can make it days in advance, just dont top it until you're ready to use it.